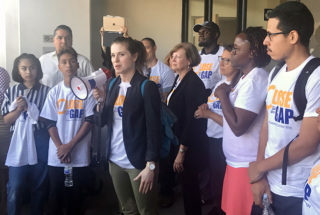 Sara Mooney, education program officer with United Way of Greater LA, and members of the CLASS Coalition celebrate the passage of the “Close the Gap” resolution outside LAUSD on Tuesday. LA Unified made a big commitment Tuesday: by 2023 all students will be college-ready, and — to make sure parents can hold the district accountable — it will now report two different graduation rates. Through unanimous approval of the “Realizing the Promise for All: Close the Gap by 2023” resolution, the board members “publicly commit” to students — including English learners, special education students, foster youth, and those living in poverty — to provide the support they need to graduate eligible to apply to a state four-year university. “We’re raising the bar, being aspirational, and believing on what we can do,” said board President Mónica García, who co-authored the resolution with board member Richard Vladovic. Ref Rodriguez and Kelly Gonez were co-sponsors. The resolution also directs the district to develop tougher school site improvement plans and exempt the principals of the lowest-performing schools from having to hire off the district’s “must-place” teachers list. Board Vice President Nick Melvoin requested Tuesday that the resolution be amended to include a requirement that the district report two graduation rates each school year — one that reflects the percentage of students who graduated meeting state standards, and another one that shows how many were eligible to apply to state colleges. The difference is what grade students receive in a set of college-prep classes called A-G courses, which all students are required to take in order to graduate. Students who pass those classes with D’s are still eligible to graduate, but they need a C or better in those classes to be able to apply to the University of California or Cal State schools. Last year, 80 percent of the senior class graduated, but only 56 percent passed all their A-G classes with a C or better. Last year, only 53 percent of Latino students, 28 percent of foster youth, and 22 percent of English Learner graduates were college-eligible, according to United Way of Greater Los Angeles’s CLASS Coalition, whose members spoke at Tuesday’s board meeting, joining dozens of parents and education advocates who rallied outside district headquarters to support the “Close the Gap” resolution. Less than 2 percent of the district’s overall budget goes to programs that specifically support higher-needs students’ achievement, according to CLASS, or the Communities for Los Angeles Student Success, which pushed for the creation of this resolution. CLASS is headed by the United Way Greater of LA and is a collaborative of 150,000 parents, students, and educators, and 70 community-based and civil rights organizations, dedicated to ensuring that all students receive an equitable education. García said the resolution pushes back on the practice of low-performing schools becoming home to displaced teachers and acknowledged that some changes will have to be made to the policy of requiring principals to hire first from the “must-place” list of teachers. “This resolution is just the beginning. LA Unified has to make changes and do things differently in order to make progress in these areas,” Superintendent Austin Beutner said. His office will have to draft a plan on how to reach those goals within 180 days. As directed by the resolution, the district will have to focus on supporting the lowest-performing schools based on the “Student Equity Need Index 2.0” resolution, which was passed in April and provides a primary funding model for the district to ensure dollars meant for the highest-needs students reach them. The superintendent will also have to report to the board on the steps that will be taken to support highest-needs schools in hiring and retaining highly qualified teachers and aides, based on the “School Performance Framework” resolution, also approved in April, which enables the district to identify and track the overall performance of each school annually with a uniform set of measures to evaluate them so parents can compare them. The resolution also aims to strengthen the improvement plans that each school is required to have. It states that “all schools engage in a Single Plan for Student Achievement development process that includes root cause analysis, cycles of inquiry and improved equity-based budgeting,” which would help schools hit higher expectations by allowing school leaders to make their own choices to improve their schools. “We have to let schools’ leadership make choices about how to best address those issues,” García said in an interview last Friday. A group of parents has been requesting for months that the district review the current improvement plans at the lowest-performing schools. “Achieving any ambitious goal requires a good plan and holding yourself accountable to follow through on that plan,” said Seth Litt, executive director of the advocacy group Parent Revolution, which is supporting the parents. “A majority of board members acknowledged that the next step to improve outcomes for kids in this district is for LAUSD to take a closer look at its current efforts to improve low-performing schools, including a close look its current school improvement plans,” he added. One of the resolution’s main objectives is to reverse the high rate of students in the district who are failing to meet academic standards. Over 60 percent of third-, eighth- and 11th-grade students scored below standards in the state tests in English language arts and more than 70 percent scored below standards in math. Those rates are even higher at chronically low-performing schools, where 88 percent of students score below standards in English and 90 percent in math. During Tuesday’s meeting, the board also approved unanimously Rodriguez’s resolution “Increasing Supports for LGBTQ+ Students, Their Families and Schools,” which among other things will recognize October as LGBTQ+ History Month and increase LGBTQ+ competency training for educators, staff, administrators, and parents. The board also approved former interim superintendent Vivian Ekchian as the new deputy superintendent of schools, at an annual salary of $262,500. Also Tuesday, the new student board member was introduced. Tyler Okeke takes up his new post in August. Prepare all students to reach proficient on Reading Assessments by the end of the first grade. Prepare all third graders to meet or exceed standards on state summative assessments, setting the foundation for literacy, college and career readiness. Prepare all students initially identified as English Learners in kindergarten or first grade to be Reclassified Fluent English Proficient (RFEP) by the end of sixth grade. Ensure all Potential Long Term English Learners, Long Term English Learners and at-risk English Learners participate in the Individual Reclassification Plan (IRP) process to ensure benchmarks are met. Ensure all Standard English Learners will experience English in classroom environments that validate, value, and build upon the language and culture of the students. Prepare all English Learners and students enrolled in Dual Language programs since kindergarten or first grade to receive Seals of Biliteracy by grades 5, 8 or 12. Prepare all eighth-grade students to be A-G ready as demonstrated by a “C” or better in grade level English Language Arts and Math. Prepare all high school graduates to be eligible to apply to a California 4-year university and ensure they are well-equipped for career opportunities as defined by the California Department of Education. Prepare all high school students to successfully complete at least one Advanced Placement, International Baccalaureate or one semester/two quarters of Dual Enrollment courses. Ensure all 4th-12th grade students will report having at least one supportive adult connection at their school site per the annual School Experience Survey. The board’s focus on improving LA Unified’s lowest-performing schools comes as the state is struggling to define and address the bottom tier of California schools. This week, the U.S. Department of Education once again rebuked California’s plan to comply with the Every Student Succeeds Act (ESSA), the federal law signed by President Obama in 2015. California has submitted several iterations of the plan since September 2017; each of them has been returned due to inadequacies. California is now one of only six states whose plans have not been approved. If the state does not secure federal approval of its ESSA plan, it risks losing billions of dollars in federal aid. “California state bureaucrats continue to fail to demonstrate the state is serious about providing equitable educational opportunities to disadvantaged students,” Bill Lucia, president of EdVoice, said in a statement Wednesday.